Another week and another DB1 bites the dust...Bernard Pollard ruptured his Achilles' and will miss the remainder of the season. Veteran George Wilson will take his place at strong safety. As if the defensive end position couldn't get any thinner, Calais Campbell is scheduled to miss the next 3-4 weeks with a sprained MCL. With the Cardinals also losing Matt Shaughnessy for an extended period of time and John Abraham on IR, the Cardinals pass rush is really hurting. Ouch. Kyle Williams missed last week's game due to a knee injury. He figures to be questionable for this week's tilt. We should have a better idea of his injury status as we the week progresses. Jon Beason was held out of last week's game, but judging by the coaching staff's latest comments, he has a good chance of playing this week. Jon Bostic left Sunday's game against the Panthers with a back injury and did not return. He is still be evaluated and was vague when question about the severity of his injury in post-game interviews. Mason Foster missed his 3rd consecutive game as he continues to work his way back from a shoulder injury. He should be undervalued upon his return. David Harris has a sprained AC joint. His Week 6 status will be determined later this week. Rolando McClain was forced from the Cowboys game against the Texans with a left groin injury. It appeared to be an aggravation of his previous injury. Additionally, Bruce Carter missed last week's game and is likely to miss this week's contest as well. Mychal Kendricks returned to practice on Tuesday after missing the team's last three games. He didn't appear to be going to hard however, so it's not necessarily a signal that he will play this week. DeMeco Ryans did not practice as he's dealing with groin injury. He is expecting to play Sunday, however. Prince Shembo put up 14 total tackles against the Giants which will prompt owners to rush out and grab him. He's still not playing in subpackages however, so he's better suited as a matchup type LB3. Chandler Jones muscled his way through a shoulder injury to play on Sunday Night against the Bengals. However, he was limited to only 20 snaps. He should see a significant increase in that number next week. Brian Cushing continues to sit in a majority of subpackages (he played 53 of 78 snaps against the Cowboys last week). He's still managed to average 9 tackles a game in that role. Owners have to be salivated with the thought on what he could produce in full time role. The Bills linebacker situation continues to be an enigma for fantasy owners. Preston Brown saw 100% of the team's snaps last week but failed to do much in the box scores and it was Brandon Spikes in subpackages, not Keith Rivers as many anticipated. It may be smart to temper expectations on Brown until we get a better read on what's going on here, but he's still got the most upside of the group by a good margin. The Arizona beat writers were predicting a big increase in Tyrann Mathieu's playing time coming out of the team's Week 4 bye...well that never happened. "The Honey Badger" saw only 15 snaps and with the Cardinals current starting safeties playing well, don't expect the Cardinals to rush him back. DE Brian Robison (MIN) - With just 7 total tackles through the Vikings' first 5 games, Robison has done next to nothing this season. But the fact remains that there are very few viable defensive end options remaining on the waiver wire. Robison has averaged 8 sacks a year over the last three seasons and faces off against the Lions who are currently giving up the 2nd most points to defensive ends and are 2nd in sacks allowed with 17. After 5 weeks of no production, I'm banking on the law of averages balancing this week and Robinson getting a sack or two. DE Jurrell Casey (TEN) - After an impressive 2013 season, Casey was fairly well owned heading into this year - with his ownership peaking after a 2 sack performance against the Cowboys in Week 2. However, three straight weeks of lackluster production (including a goose egg last week) have owners jumping ship on the 4th year player. I'm not saying Casey is going to hold his ADP value (I wasn't as high as most on him anyway), but I'd have him in my lineups this week against a Jacksonville team that is allowing over 4 sacks per game. DE Frostee Rucker (ARZ) - Owners were dealt a difficult blow this week upon receiving the news that Calais Campbell is likely to miss 3-4 weeks with a MCL sprain. Frostee Rucker saw the lion's share of snaps in his absence and managed to take down the hard to sack, Peyton Manning. Expect him to see a near-full workload this week against the Redskins, a team that is allowing the 5th most points currently to ends. SLB Justin Durant (DAL) - Injuries and overall lack of depth have made the Dallas linebacker situation a hard one to track from a fantasy standpoint. At one point or another, virtually all of the Cowboys' linebackers have had standout games. However, Durant has posted lines of 7-1, 3-5 FR and INT, and 6-0 in the games he's played this season. And with both Rolando McClain and Bruce Carter banged up heading into next week's game, Durant be a very nice option against a run-heavy Seahawks team. WLB Sio Moore (OAK) - Although I included Moore on this list earlier in the season, he deserves another mention. After being one of the most added IDPs after a studly Week 1 performance, he's been dropped in a lot of leagues after not playing over the last three weeks (he missed Weeks 3 and 4 due to injury and the Raiders were on bye Week 5). With Nick Roach facing possible retirement, Kaluka Maiava recently placed on IR, and Miles Burris greatly underperforming, Moore will face minimal tackle competition from other linebackers. The Chargers matchup this week is average, but Moore is still a solid LB3- play with higher rest of season value. SLB Emmanuel Lamur (CIN) - With Vontaze Burfict struggling to make his way fully through the concussion protocol, there's a chance he will have to sit out again in Week 6. If that's the case, Lamur gets a nice bump in value. Panthers are a middle of the road matchup, but 6-8 total tackles is a reasonable projection for undrafted free agent out of Kansas State. WLB Jacquian Williams (NYG) - Williams is coming off an impressive 14 tackle performance against the Falcons last week. Signs are pointing towards Jon Beason making a return in Week 6, but even if he does, he will likely be limited. Williams is an every down player regardless and is currently on pace for 125 total tackles. That's not a sustainable pace for him and his numbers are inflated from last week, but he's not a bad LB4 fill-in for those in deeper leagues. SS Kemal Ishmael (ATL) - After losing LaRon Landry to suspension in one my leagues, I was forced into scooping up a DB off the relatively thin waiver wire. Luckily, after a good amount of research, I settled on Ishmael who paid off in spades with 14 total tackles (9 solos) and tied with Paul Worrilow for the team lead in tackles. Granted, his numbers were inflated due to the Giants matchup but I don't think the stat line is a complete fluke. He's a safety who prides himself on his tackling ability and plays behind one of the weaker front sevens in football. This said, it's safe to slide Ishmael in as a high variance DB3. 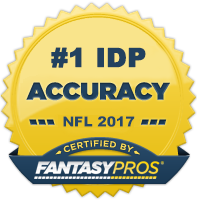 SS George Wilson (TEN) - The season-ending injury to Bernard Pollard opens the door for Wilson to return to IDP prominence. He's seen success in the past with three 70+ solo tackle seasons during his career. Seeing as the Tennessee strong safety position has been a fantasy gold mine in recent seasons, he is well set up to put up 5 solos a game and provide owners with DB3+ value. SS Quintin Demps (NYG) - Demps has done a decent job since taking over the strong safety duties from Stevie Brown a couple weeks ago. He's had an interception in back-to-back games and is a relatively high floor tackle option playing behind one of the league's weaker tackling linebacking crews. Additionally, as talked about in my IDP Return Men column, he's also the Giants main kick returner which gives owners in return yardage leagues an added bonus.